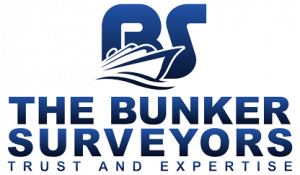 THE BUNKER SURVEYORS IS fully focus to prevent any kind of accident along bunkering operations. On due of that THE BUNKER SURVEYORS has a team of well-trained boarding surveyor that work jointly with Crew preparation of the ship to prevent any risk as the bunkering is one such process on the ship which has been the reason for several accidents in the past. Bunkering on a ship can be of fuel oil, sludge, diesel oil, cargo etc. Bunkering of fuel or diesel oil requires utmost care and alertness to prevent any kind of fire accident or oil spill. 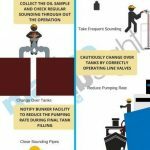 For that we would like to share with this article the importance on the bunkering procedure on a ship and what are the important points that are to be taken into consideration while bunkering. What Does The Word “Bunker” Mean? The word “Bunker” is used extensively in defense forces and is used to define an area to store and safeguard personnel and supplies (such as fuel, ammunition, food etc.). It was derived from a Scottish word “Bunk” which means a reserved seat or bench. In the shipping industry, the word bunker is used for fuel and lube oils, which are stored on a ship and used for machinery operation only. If a vessel is carrying marine fuel or lube oil to discharge it to another port, it will not be called “bunker”. 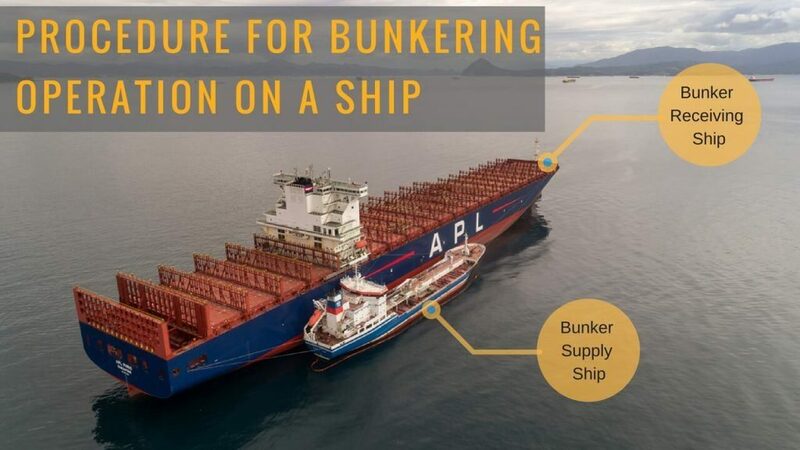 If the vessel or truck is carrying it to transfer to another ship for using in its machinery, it will be termed as “bunker” and the operation performed to transport the oil is known as “bunkering”. Hence, bunker fuel or bunker oil on a vessel are marine fuel/ lube oils which are carried on separate storage tanks, popularly known as bunker tanks for consumption in ship’s machinery. The Bunker fuel can be supplied to a cargo ship in different ways. The mode or method may vary depending upon the grade or type of fuel being delivered to the vessel. There can be different types of bunkering facilities which supply the required marine fuel or lube oil to the ship. A small barge or ship carrying bunker fuel can be used to transfer marine fuel oil (such as heavy fuel oil) to the vessel. If the quantity of oil is less (e.g. lube oil or MGO, LNG etc. ), it can be supplied to the vessel using trucks. 1.The chief engineer should calculate and check which bunker oil tanks are to be filled after he/she receives confirmation from the shore office about the amount of fuel to be accepted. 2. It might be required to empty some tanks and transfer the oil from one tank to other. This is required to prevent mixing of two oils and prevent incompatibility between the previous oil and the new oil. 3. The sounding of other fuel storage tank (not be used in bunkering operation) should also be taken to keep a record of fuel already present onboard. This will help the ship’s officer in case any valve is leaking, and the bunker oil is being transferred to the unwanted tank. 11. 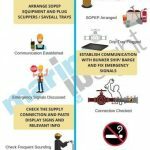 Onboard communication, signs, and signals to stop the operation between the people involved in bunkering are to be understood by all the crew involved in the operation. Related Read: What is Cappuccino Bunker Effect On Ships? Realted Read: What is Ship-Shore Interface Management in the Shipping World? 6. During bunkering, sounding is taken regularly and the frequency of sounding is more when the tank is near to full. Many vessels have tank gauges which show tank level in control room, but this is only to be relied upon if the system is working correctly. Related Read: How and Why to Take Manual Sounding On Ship? 9. The crew needs to switch (open and close the valves) the internal storage tanks to accommodate the quantity of the bunker oil being supplied. 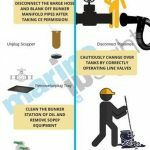 Utmost precaution needs to be taken when opening the other storage tank valve and closing the valve of the tank which is reaching the maximum fill limit. 1. Once the bunker is finished, it is a general practice to air blow the bunkering supply line for discharging all the oil trapped in the pipelines. At this stage, ensure all sounding pipe caps are closed and keep a watch on those storage tank vents which are at its maximum limit. 6. In general, for each degree of increase in temperature the density should be reduced by 0.64 kg/m3.